This post has been in my queue for six months now. 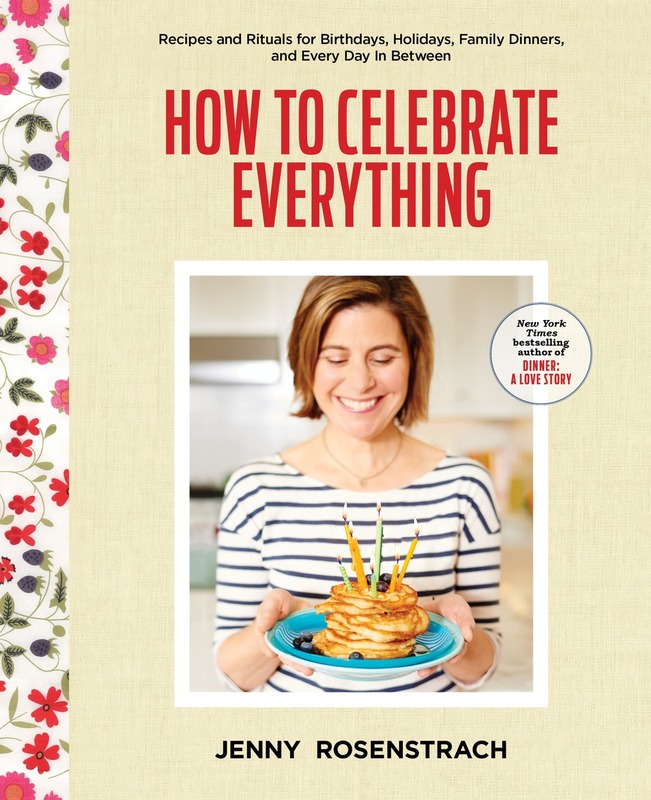 I added it back in March, was when I was madly cooking my way through spring’s cookbook offerings so I could write about the best ones for The Book Review. As you may recall, the dinner table was getting a major shot of adrenaline during the testing phase. There were socca pizzas and poke bowls. There were chocolate loaf cakes and fried zucchini blossoms. There was a lot of gochujang. But it was this simple brussels sprouts dish, from Jeanine Donofrio’s magical Love & Lemons, that has held the distinct honor of “Making it into the Permanent Dinner Rotation.” (An accolade, in my mind worth at least as much as a Best Cookbook Award from one of the country’s most venerable publications, amiright?) When I first made the dish, Brussels were slim pickins at the market — which doesn’t mean I’ve been too proud to make it with a bag from Trader Joe’s — but now they are slowly but surely finding their way back, so I wanted to be sure you had this recipe in your arsenal. It’s vegan and gluten-free for those of you who are into that kind of thing, but more important, it’s like a carnival of flavors: sweetness from the coconut, heat from the Sriracha, depth from the brussels, a smoothness from the avocado, an all-around umami-brightness from the sauce. It’s a goodie. Cook the rice according to package instructions, using coconut milk instead of the water. Fluff with a fork to keep warm. Make the sauce: In a small bowl, whisk together the tamari, minced garlic, lime juice, rice wine vinegar, sugar, water, and chilies. Set aside. Heat the coconut oil in a large skillet over medium-high heat. Add the brussels sprouts, cut side down, along with the salt. Let them sear until the cut side becomes golden brown, 2 to 3 minutes. Toss and continue cooking for an additional 7 to 10 minutes, or until tender. Add the scallions during the last 2 minutes of cooking. Remove from heat. 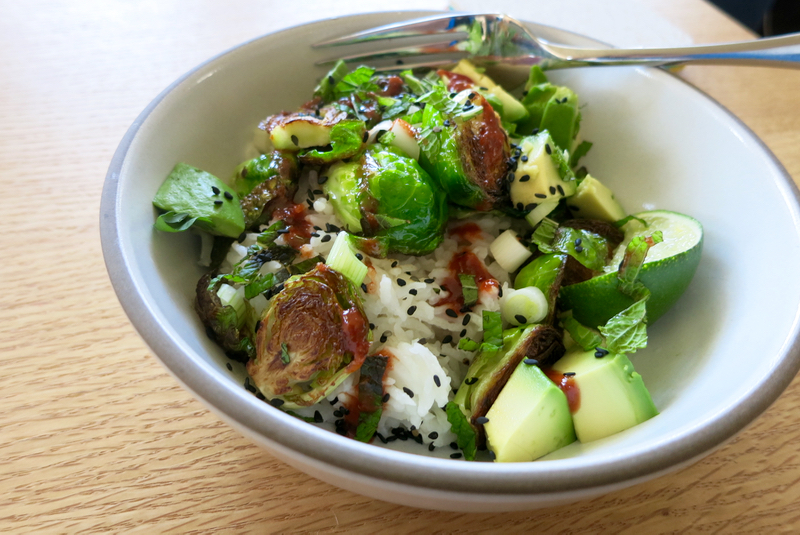 Serve the rice in bowls with the brussels sprouts, basil, mint, avocado, sesame seeds, and sauce drizzled on top. Serve with Sriracha and lime slices on the side. As a self-appointed representative of your gluten-free + vegan readership, this recipe makes me dance with joy! do you serve this alone? What are your suggestions as to what to serve as a protein with it? Sarah (and Jen and Kayce) — I actually think it is substantial enough to stand alone as a vegetarian meal. Especially if you are heavy handed on the avocado. But if you were to add a protein, I guess I’d have to say shrimp would be the most logical. Actually, not only logical, but delicious. Another protein option that’s delish in rice bowls of any kind is edamame! I, too, wait with baited breath for your suggestions for a protein that would go nicely with this! I would throw some shrimp on top except that the rest of my family would not eat shrimp. Possibly beans of some kind? Or rotisserie chicken? Ideally this could be a nice one-dish meal if it had just a little bit more heft to it – it wouldn’t need much. Also, soy sauce can be subbed for tamari pretty easily, right? No need to add to my pantry? This looks delicious, and a perfect excuse to eat more avocado. And rice. And brussels sprouts. My layman’s understanding is that tamari is a wheat-free, lower-sodium soy sauce. So I think you could easily substitute soy sauce, but the recipe would no longer be gluten-free and you might want to consider using a little less or cutting down on salt elsewhere in the recipe. I tried tamari for the first time a year or two ago. The flavor is identical (to me) as soy sauce and in our local store the price is the same as well. I now buy it instead, knowing that I am leaving the soy out for any potential guests. Sorry, meant to say leaving gluten out, not soy. I’m dying to know- what IS on the Permanent Dinner Rotation? 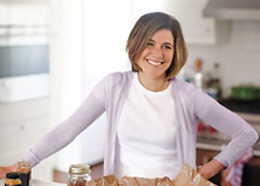 You have such an amazing recipe archive, but I don’t know where to start in terms of tried-and-true weeknight dinners! Yes, me too! That was what I was hoping this post was about when I clicked on it. Not that I’m disappointed! This is going in my next week’s meal plan. Hi Jennie, I’m going to make this for dinner tonight and I was wondering when you add the sauce? I couldn’t see when to add it in the recipe. Do the sprouts cook in it for the last 7-10 minutes or do you pour it over the top when you serve? Thank you! It looks delicious. You drizzle the sauce on top after serving. Sorry to skip that! I will fix now. Hope it goes ok. This was incredible!!! Amazing flavor 🙂 I oven roasted the Brussels and a sweet potato. Everything else as instructed and whew, so delish. With the coconut rice and avocado, this is a rich and creamy dish. 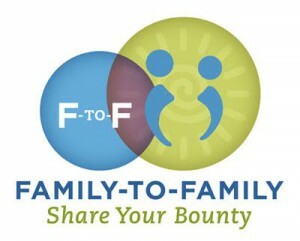 I agree…it’s officially in the rotation now!